If Tuesday night’s California gubernatorial candidate forum had been a debate, the hands-down winner would have been a slender 11-year-old in a mint-green dress shirt. 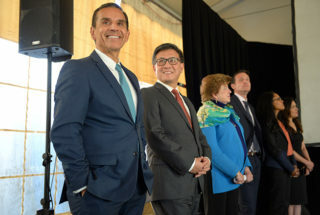 As was the case for much of the evening, the candidates present — former Los Angeles Mayor Antonio Villaraigosa, state Treasurer John Chiang, and Delaine Eastin, the former state superintendent of public instruction — were short on specifics and long on assurances that education and social welfare issues topped their agendas. Charter schools, teacher tenure reform, and other education topics that typically serve as political flashpoints did not arise at the forum, which took place in front of roughly 450 people, many of them community activists and students, gathered at the Los Angeles Trade Technical College. It was the only candidate event to date focused exclusively on education and children’s issues. A point driven home by all three candidates was that California was notable in its treatment of children for too many of the wrong reasons — in its high number of homeless and foster youth and its low number spent on education. Eastin pointed out that the state spends $75,000 per year on prisoners yet ranked 41st in per-pupil expenditures. “We just can’t afford to have Cadillac prisons and jalopy schools,” Eastin said, to resounding applause. The trio agreed, for the most part, on the need to increase state K-12 school funding, to provide greater access to preschool, to provide more counselors and nurses and in-school services for struggling students and families, and to support DACA recipients. They also recognized that California’s Local Control Funding Formula (LCFF), which promised additional resources targeted to low-income students, foster youth, and English-language learners, needed tighter accountability. Right now the money gets “spread all over like peanut butter,” Villaraigosa quipped, going to all parts of a school district and not just the neediest students in those districts. The lack of a sharp debate was perhaps a reflection of the absence of front-runner Gavin Newsom, California’s current lieutenant governor and two-time San Francisco mayor. Also a no-show was John Cox, a Republican and Southern California businessman, vying for second place with Villaraigosa. Villaraigosa twice seized the opportunity to drive home Newsom’s not being there, turning each time to the two other candidates on the dais and, with a pointed flourish, thanking them. If Villaraigosa bests Cox in California’s June 5 open primary, in which the top two vote-getters will go on to the November general election regardless of party, K-12 policy is likely to emerge as a critical issue. A March poll identified K-12 issues as “very important” to 64 percent of California voters. And both Villaraigosa and Newsom have track records that have galvanized supporters and opponents in years past. Villaraigosa long ago earned the unions’ ire for his support of the Vergara lawsuit, which challenged teacher layoffs based solely on seniority. During his time as mayor of Los Angeles, he clashed frequently with the teachers union, which he contended blocked progress in schools. In recent weeks, a number of deep-pocketed charter school supporters donated $12.5 million to an independent expenditure committee supporting Villaraigosa’s candidacy. Hot as the issues that likely drove those contributions are, they were not the focus of the Los Angeles forum, which was sponsored by the Children’s Defense Fund–California, the Children’s Partnership, and The Chronicle of Social Change. LA School Report was a media sponsor, along with the Los Angeles Daily News. *This article has been updated to correct that the student speaker is from South Los Angeles but attends Open Magnet Charter School.